In today’s class we will cultivate the courage to bring acceptance and grace to the change and transformation that inevitably arises in our lives when asked to let go. We will do this through yoga postures that invite letting go, but also through the warrior postures to plant the seeds of courage in our lives. We are also continuing with the Guru Mantra and the Shiva aspect with a story of letting go. We will do this by chanting the Guru mantra with the Yamapasha Mudra. This mantra is found in the Guru Gita. To the guru I offer, all that I AM. Today we will focus on the Shiva aspect of the Guru mantra. Shiva is the God of death and dissolution. Shiva brings about every kind of ending from relationships and ideas to illness and our physical death. Through the God of dissolution and death we acquire the tools to deal with change, because we cannot be attached to anything which we know will inevitably die. Many people are uncomfortable with Shiva’s fires of transformation. However, with complete compassion, Shiva clears the path in our lives so that new possibilities can form and he creates a clear path where the new can arise. Shiva can help us clear out our old belief systems and paradigms that are no longer serving us so that the deeper truths of our Self can arise. Shiva’s energy is destructive, but through the fires of transformation he creates the opportunity for new growth. Today we are going to hear a story about an old woman. This old woman lived in the forest and every day she would pray to Shiva and make offerings to him on her altar. All day long she would sing, “Om Namah Shivaya.” This woman lived a meager existence and had very little, but she was happy with her simple life and her devotion to her beloved Shiva. One day the old woman went to the market. She had to be very careful at the market because she had very little money and what she purchased at the market had to last her the whole week. The woman made her way through the market and purchased the food she needed for the week. On her way out she eyed the most beautiful mango, her favourite fruit. It was perfectly ripe and ready to eat that day. The old woman was overjoyed at his kindness and her luck. She walked home thinking about the delicious dessert she would enjoy that evening. When she got home she began to prepare her stew for the week. When the stew was cooked, she poured a small bowl for herself and ate it, the whole time thinking about how delicious the mango would be. When she was done her stew she cut into the juicy mango and enjoyed each bite. She decided to eat only half since it was such a rare treat and save the rest for the next day. She said her nightly prayers to Shiva and went to bed. In the middle of the night, there was a knock on the door. At this time, and in this place, rules of hospitality were more important than sleep or safety, so she answered the door. She was greeted by an old hunchbacked man with a cane. The old man told her he had been walking for a long time and needed to rest so he asked if he could come in. When he came into her small cottage he commented on how delicious her stew smelled and asked if he could have a bowl because he was so hungry. Well of course he gobbled up bowl after bowl until the poor old woman’s entire pot for the whole week was gone. The old woman’s heart fell into the pit of her stomach. If only she had enjoyed the entire mango earlier this evening she wouldn’t be in this predicament now. She looked over to her beloved Shiva on her altar, hating herself for all the feelings of selfishness and lack that were going through her mind. The old woman took a deep breath, said a little chant to Shiva and gave the mango to the old man. The old man ate the mango in one bite. The old woman sighed, and offered the man her meager mattress finding a place in a quiet corner for herself for the rest of the night. In the middle of the night, the old man woke her. “What’s wrong?” the old woman exclaimed. Right before her eyes, the old man’s features began to change and he began to take the familiar form to her of Shiva. Shiva spoke to her, “Because of your consistent devotion and your ability to offer what you have with your whole heart you are coming with me. Your physical life is over, but your spiritual life is beginning.” And off they went together. Reflect on what this story means to you in your life. Can you think of a time in your life when you had to let go of something that was really important to you? Something as delicious as the old woman’s mango? Maybe it was a possession, maybe it was a belief or way of being. When we let go, we open the door to a spaciousness in our life and new ways of being. Usually we must undergo some form of transformation, that involves a death of some kind. It takes courage to allow death to bring forth new life. Changing circumstances, disappointment, personal challenges, are the presence of constant change and transformation that take place in our lives. Bringing acceptance to change and transformation is the grace of courage. 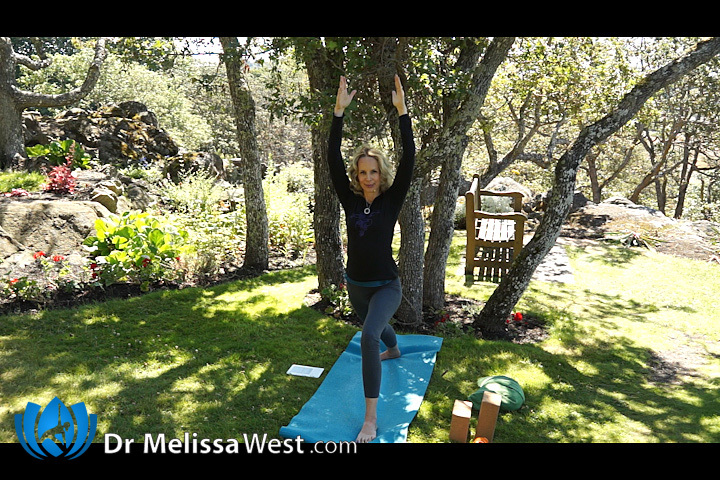 Next post: How can yoga help with COPD?